not that i can really judge children’s librarians. i was pissed of cause our own children’s librarian did a superhero cape making activity yesterday and I wasn’t told about it. however next week it’s superhero origami, and we are all set to make ninja stars, samuari helmets (I mean superhero hats) and paper planes, culminating in a paper plane fly-off at the end. i need to find the perfect plane design that will deliver me the prize but cristian the paper plane guru is out of town. what am i going to do? 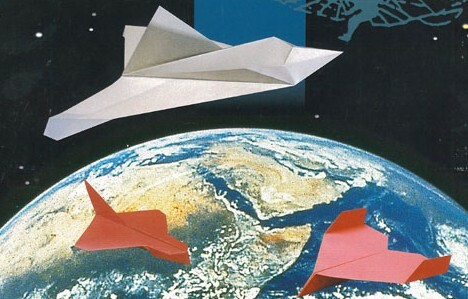 speaking of origami flying objects… Origami spaceplane to launch from space station. this is a japanese thing of course.